It’s all about money. What we need to do is keep up public pressure for improvements in infrastructure, transport, sewerage. The world spotlight is firmly on Brazil nowadays, with the country hosting the world’s two largest sporting events2 inside two years. Yet trouble is brewing: the economy once touted as a future star performer, is dragging while the government uses a time-honoured method in an attempt to drag the country back up. That report put these countries as the benchmark for the rest of the emerging markets and, to some extent, this has panned out (see chart 1). The group has since become formalised and the small ‘s’ has become a large ‘S’ as South Africa was invited to join the summits. However, falling oil prices and local issues (such as Russia’s stock market and currency drops post-Ukraine crisis and Chinese poor trade results and stock market crash) have recently revealed chinks in the BRICS’ armour. 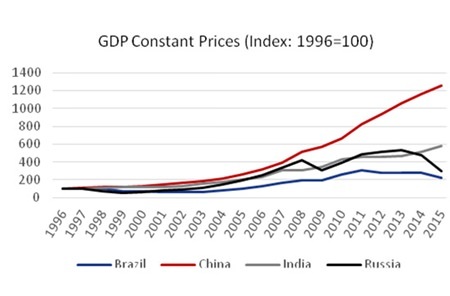 Brazil is a case in point – and a deceptive one at that. 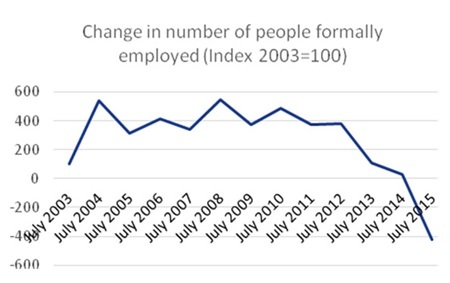 It had enjoyed year-on-year growth since 1992 (with the exception of the fallout if the GFC in 2009) and initiatives such as the Bolsa Família programme have been praised for their reduction in the percentage of people living in poverty.6 Furthermore, unemployment levels have been around the 5-6% mark since 2011 (2001-2006 saw rates between about 10% and 12%).